Decentralized Rural Infrastructure and Livelihoods Project Phase III (DRILP III) is a joint project of the Government of Nepal and Swiss Agency for Development and Cooperation (SDC). 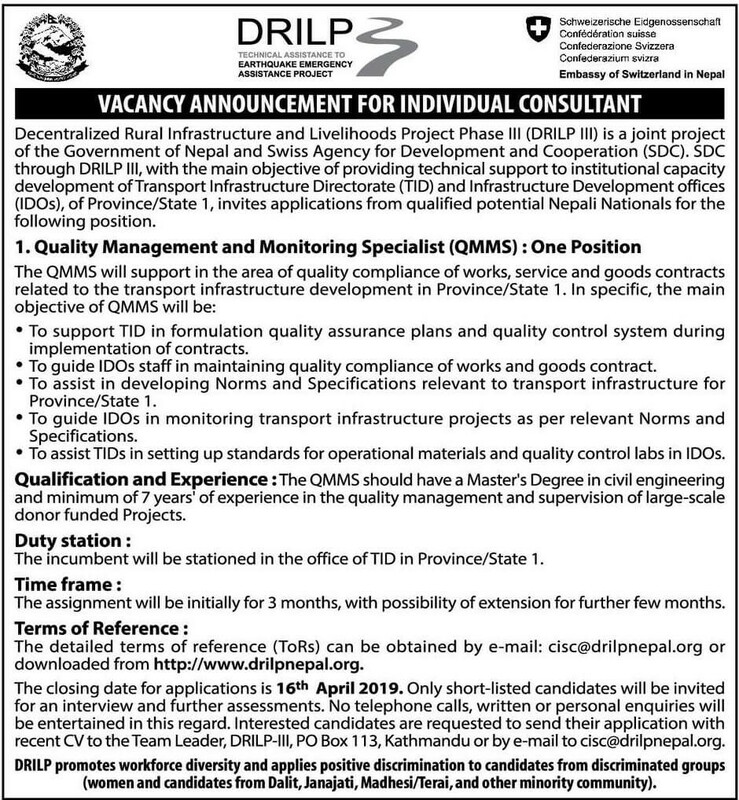 SDC through DRILP III, with the main objective of providing technical support to institutional capacity development of Transport Infrastructure Directorate (TID) and Infrastructure Development offices (IDOs), of Province/State 1, invites applications from qualified potential Nepali Nationals for the following position. To support TID in formulation quality assurance plans and quality control system during the implementation of contracts. To guide IDOs staff in maintaining quality compliance of works and goods contract. To assist in developing Norms and Specifications relevant to transport infrastructure for Province/State 1. To assist TIDs in setting up standards for operational materials and quality control labs in IDOs. Qualification and Experience: The QMMS should have a Master's Degree in civil engineering and a minimum of 7 years' of experience in the quality management and supervision of large-scale donor-funded Projects. The incumbent will be stationed in the office of TID in Province/State 1. The assignment will be initially for 3 months, with the possibility of extension for further few months. The closing date for applications is 16th April 2019. Only short-listed candidates will be invited for an interview and further assessments. No telephone calls, written or personal enquiries will be entertained in this regard. Interested candidates are requested to send their application with recent CV to the Team Leader, DRILP-III, PO Box 113, Kathmandu or by e-mail to cisc@drilpnepal.org. Application deadline: 16th April 2019.